Happy Thursday! Candace here! 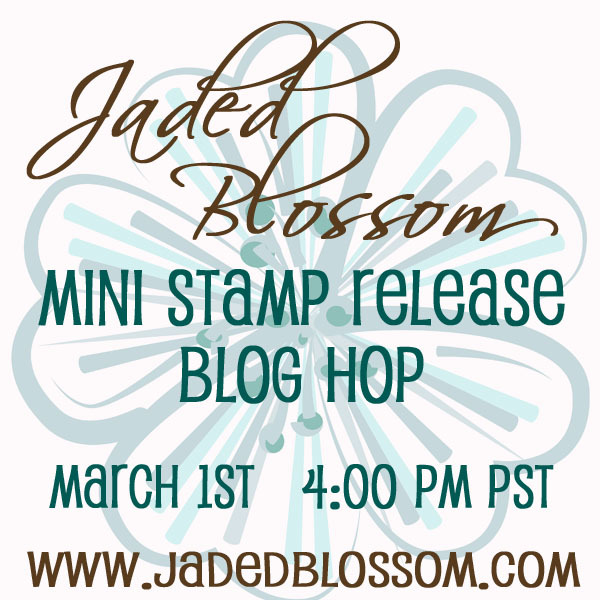 I am so in love with the Jaded Blossom March Stamp release! 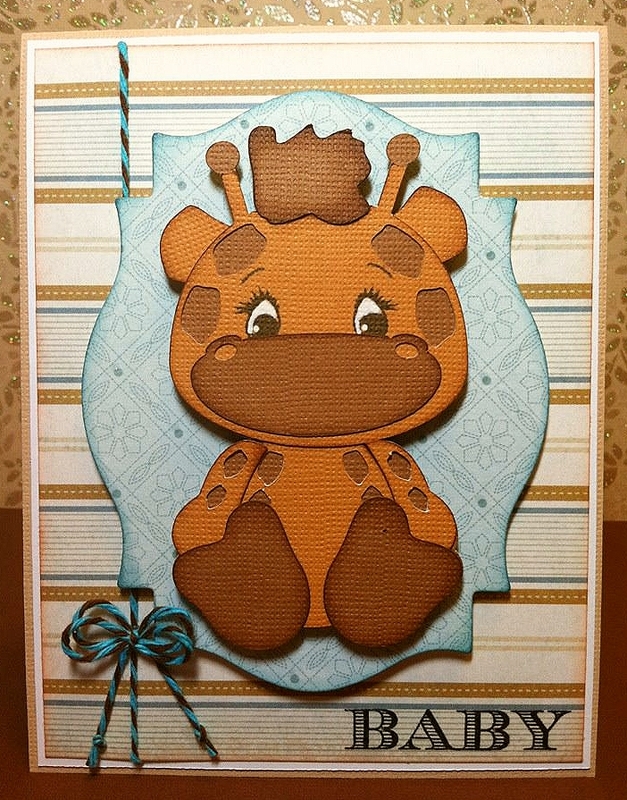 Here is a baby card I created! The "baby" stamp is from Babies & Weddings! 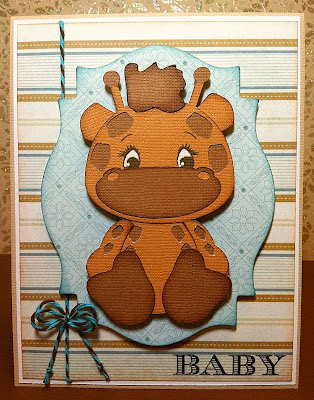 This cute little giraffe was cut from Treasure Box designs and I also used my spellbinder for the light blue piece behind him. I simply love this set. It is so stinkin adorable. This little guy is on an action wobble too. 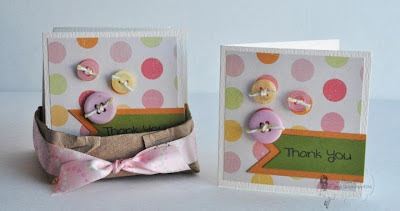 To see more details feel free to visit my blog. Thanks yall so much for stopping by! 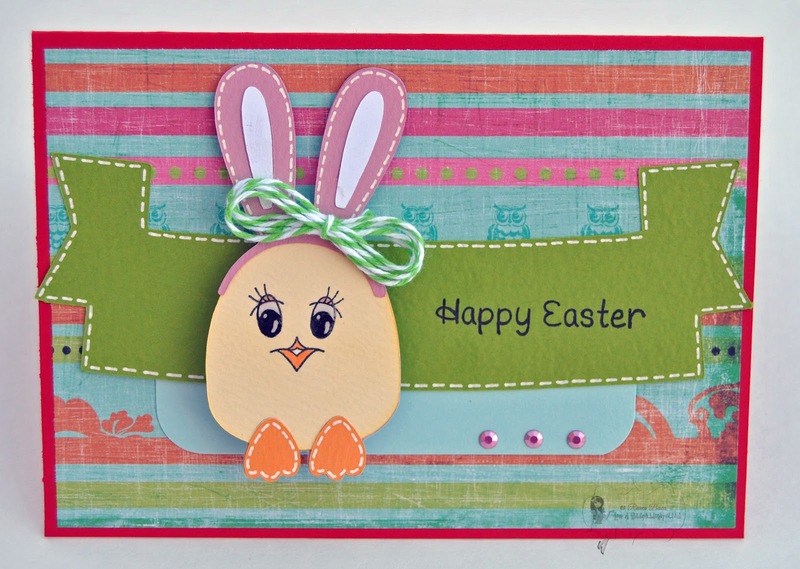 Over here at Jaded Blossom we are wishing you all a happy chick bunny day! Good Morning Jaded Blossom friends! It's Abby here with another treat to show you guys and some awesome news! 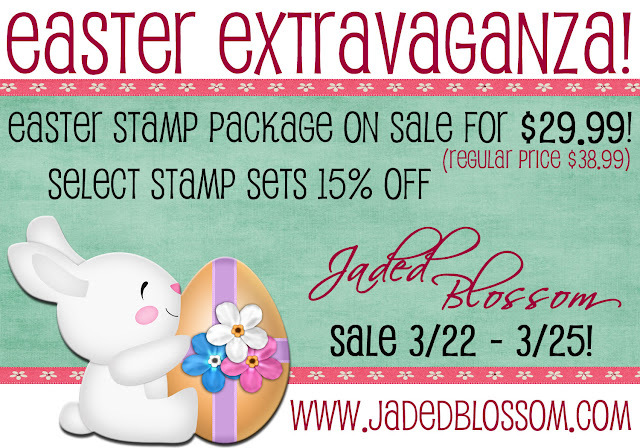 Before I do share the awesome news, have you heard of the Easter Extravaganza Jaded Blossom is having?!?! 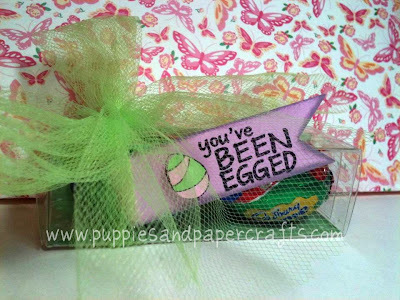 They have their Easter Stamp Package for only $29.99!! Yep! Isn't that a sweet deal?! 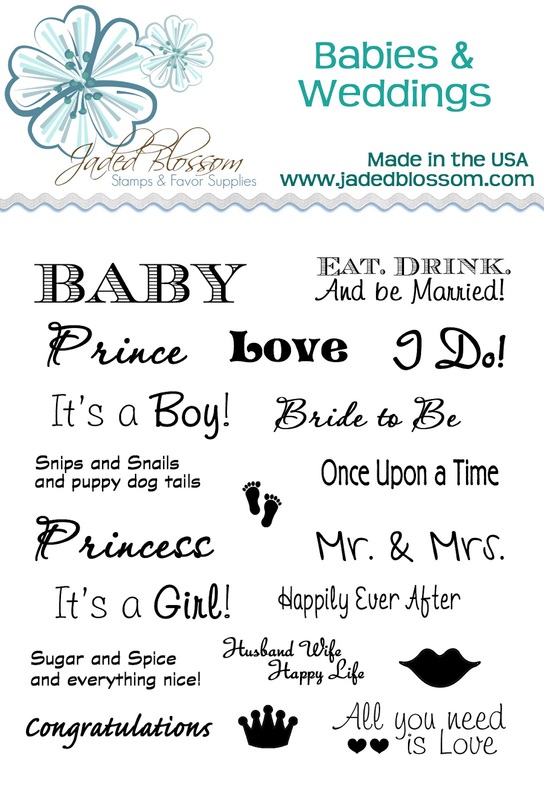 They also have selected stamps 15% off! So, what are you waiting for!! Click HERE to go shopping! 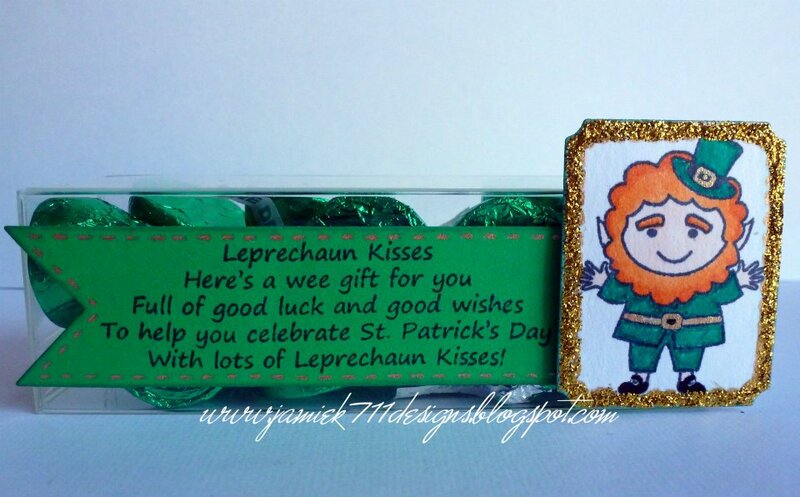 So, I wanted to show you a little treat I created using a couple of the sets that come in the SALE package! 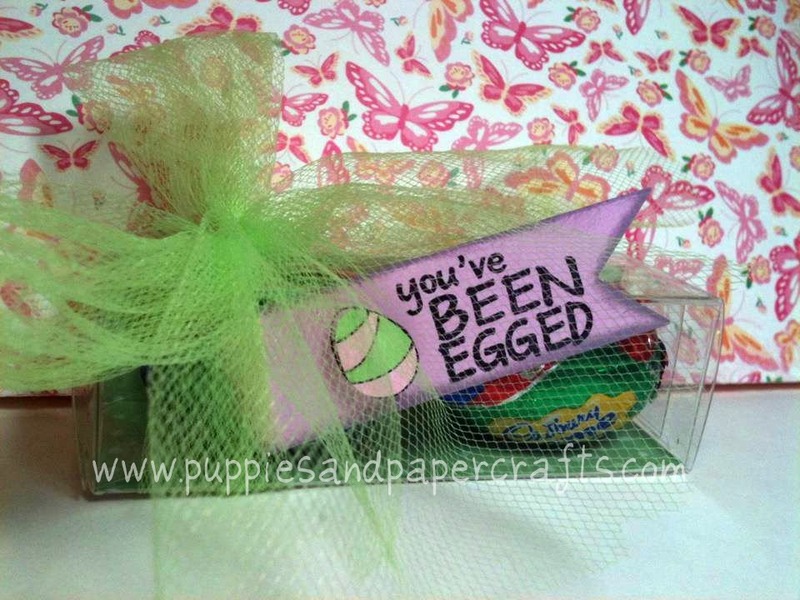 I used the the LOVE BUNNY and the EASTER OWL for my treat box! You can purchase the package HERE!!! Now, about my news! 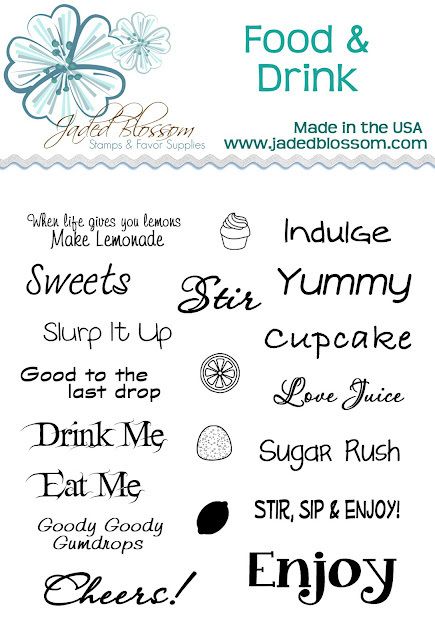 I am so happy to tell you guys that I am a designer (not just a Guest Designer) for Jaded Blossom! 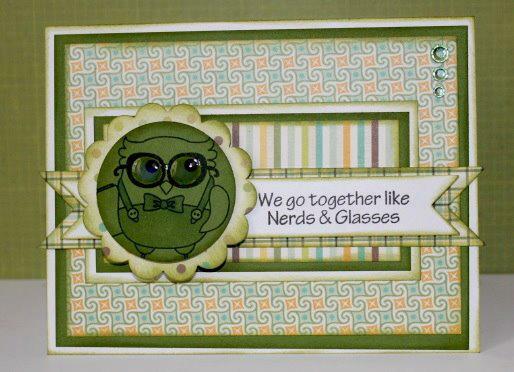 I am super excited because I truly have fun designing with Michelle and Candace's stamps! Thank you so much for stopping by and don't forget to visit the Jaded Blossom store! You do not want to miss this awesome sale! Happy Friday! We are excited to announce our first ever sale! We are calling it an Easter Extravaganza because all Easter stamps are on sale!! 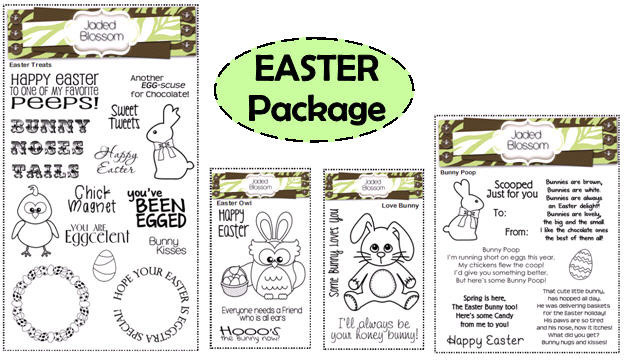 Easter Stamp Set Package includes Easter Treats, Bunny Poop, Easter Owl and Love Bunny! 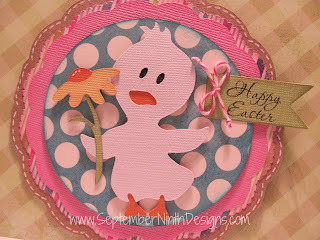 Make sure to check out the design team blogs all weekend long for some Easter inspiration! Lets start you off with an EASY Easter Treat! For this treat I got some 4x6.5 inch bags from walmart in the craft section. 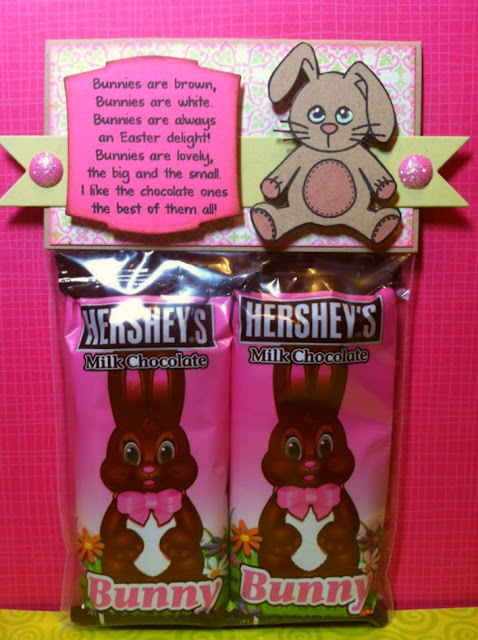 I got the little chocolate bunnies from walmart as well. 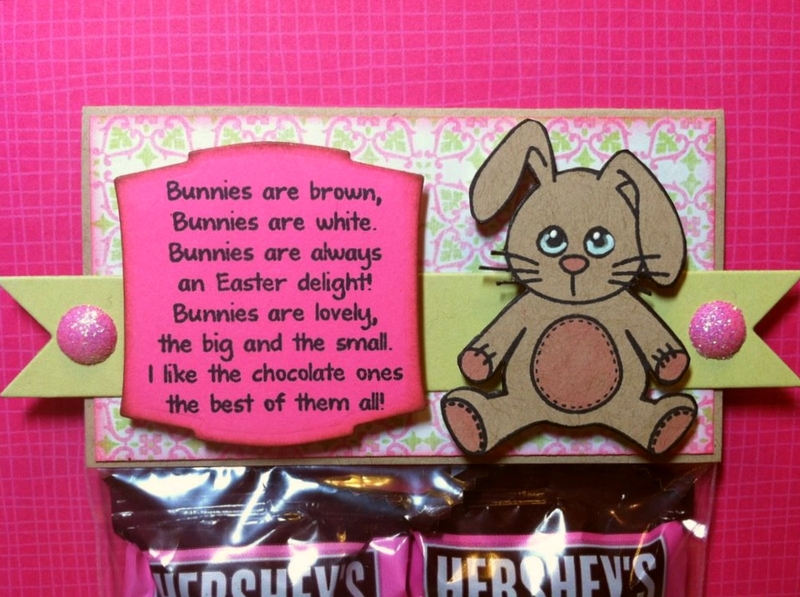 The bunny is from Love Bunny, poem is from Bunny Poop and I used the small Jaded Blossom flag die in the background. 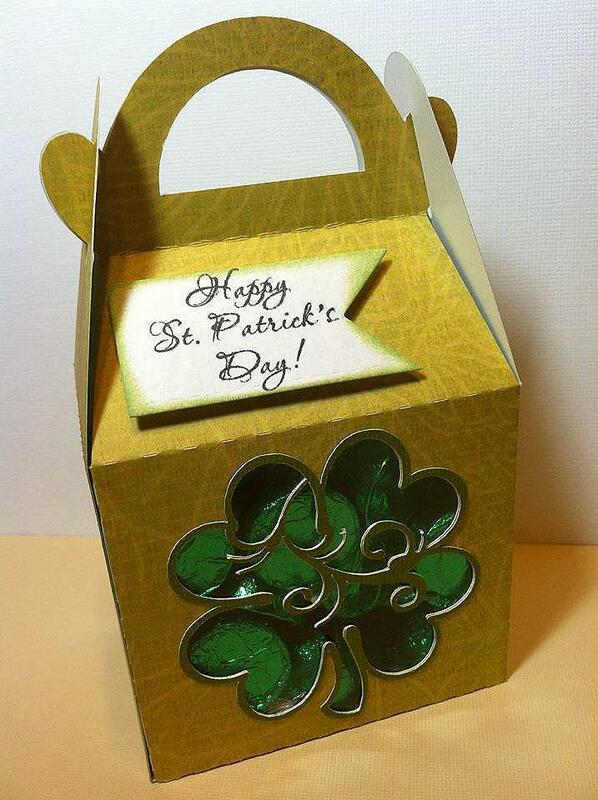 The topper is 4x2.25 inches (4x4.5 inches prior to folding it in 1/2). Here is a close up for you.. 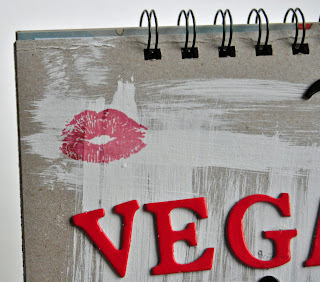 Thanks for checking out the blog today! Hi there!! Its Kim again! 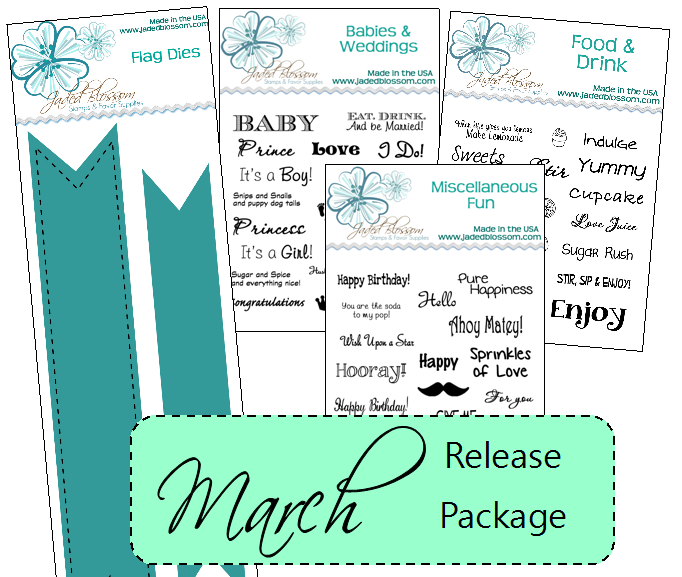 I am so excited to share my little treat with you!! 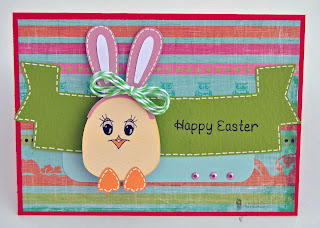 This is one of my ABSOLUTE favorite Easter Stamp Sets from Jaded Blossom!!! I don't know about you but I was always considered a "chicken" among all my friends because I wouldn't "egg" someone. Well now I don't have to be a chicken anymore and can "egg" all my friends and family as much as I want to! 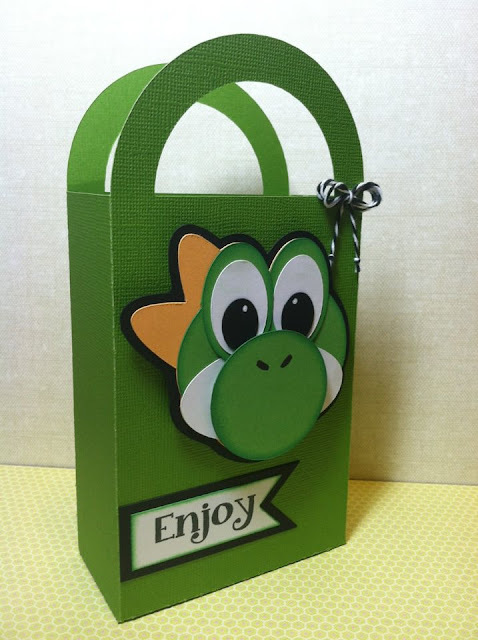 It's Jamie here to share another project with you! Today I made my project with the Bunny Poop set. How cute is this bunny?!?! Here's a close up of the poem from Bunny Poop I stamped on a scallop circle. 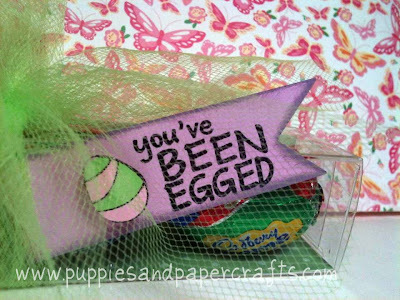 *I took the eggs from the Bunny Poop, and Easter Treats sets to use as accents. *Then I accented them using a glitter gel pen. 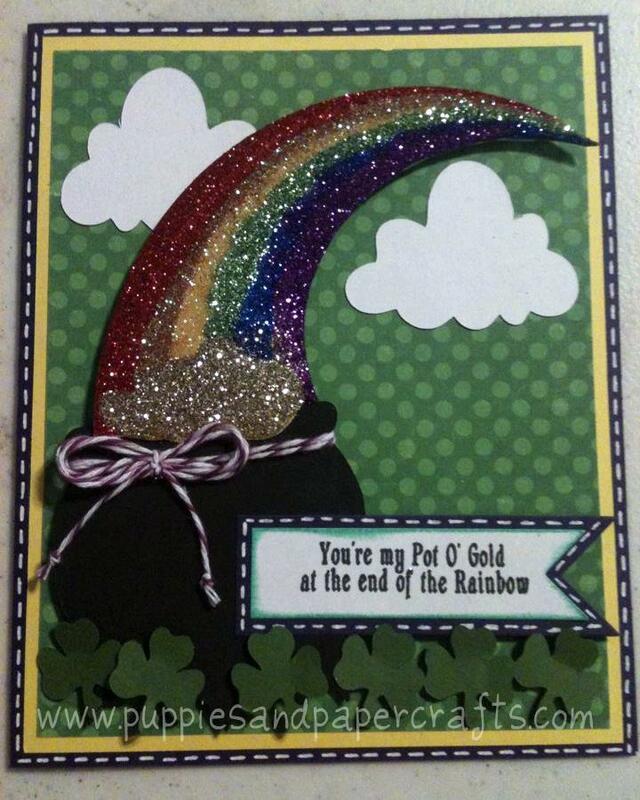 Hello everyone, this is Abby, your guest designer for this month! and you know what? I am LOVING it!!! Today I bring to you one of my favorite cards ever!! 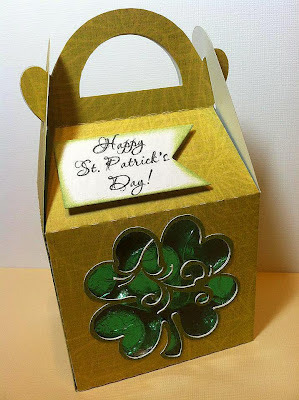 I made this one at scrap night with Michelle and Candace (owners of Jaded Blossom). I knew I was saving it for something special! 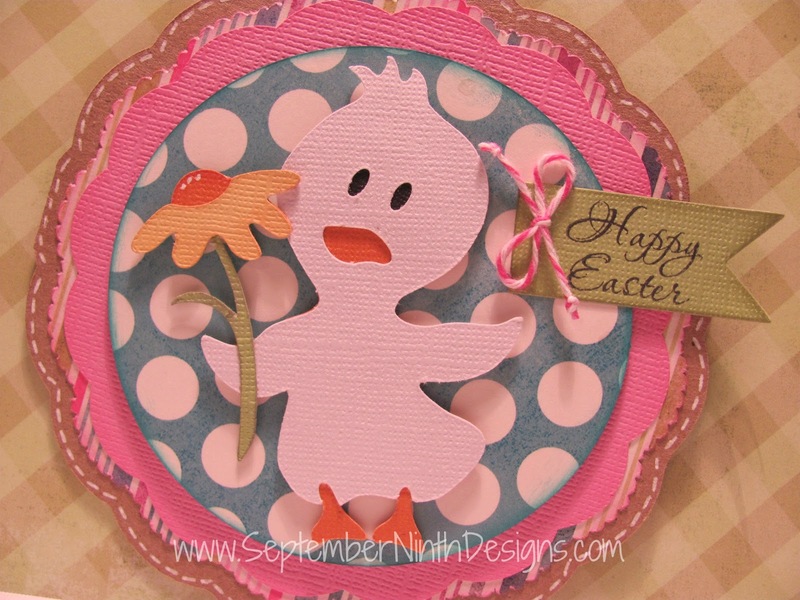 Melissa from Scrappy MAC Designs! Congrats Melissa! 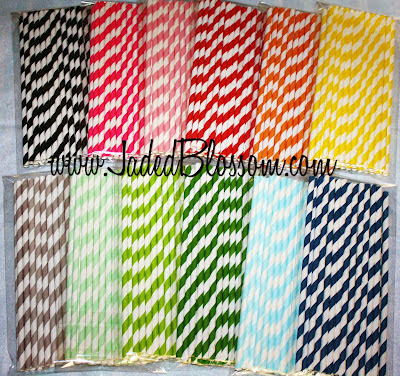 Please email us your address at admn@jadedblossom.com and we will get your prize (M&M/Skittle Sticks) to you! Make sure to check back on Sunday April 1st for the next challenge! Happy Thursday! 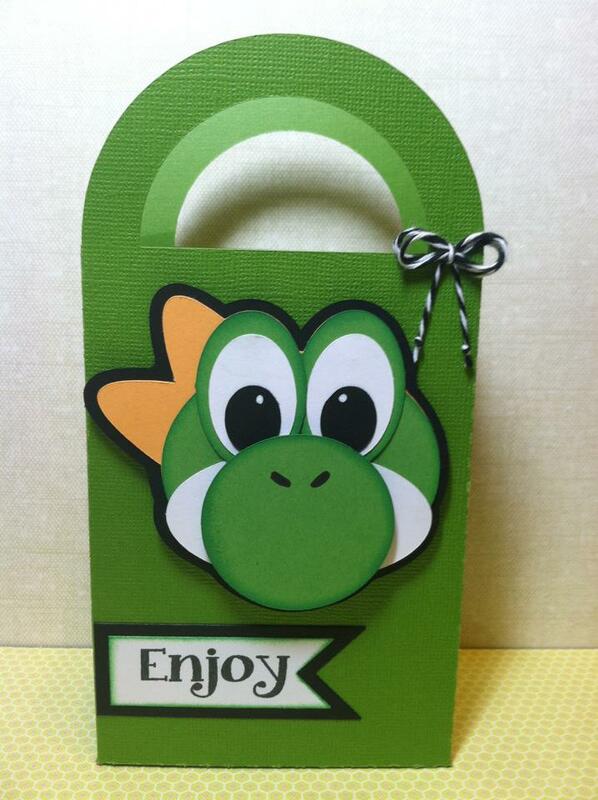 Candace here.. Today I am sharing with you some goody bags I made for my nephews birthday party! I used both flag dies and "Enjoy" is from Food & Drink stamp set. Here is a side view..
Don't forget to participate in the Monthly challenge! The winner is announced on Sunday! Okay so you know how Smash books are all the rage these days? Okay maybe that's just me but they are pretty awesome. I actually just recently bought one. 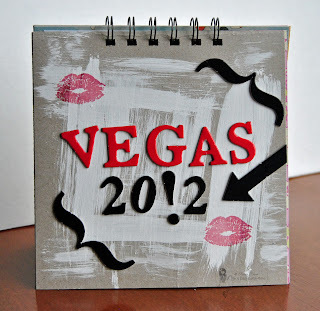 I LOVE the concept behind them and I wanted the kids to have something similar for our trip to Vegas this week. Here let me show you the cover and then I'll fill you in on what I did. Then I used paper from my stash. Since I wanted this to be asexual I had to add both masculine and feminine colors so I just cut what I had into 6x6 squares. Most of the scraps ended up being 3x6 those were added as well. And then I also found some envelopes (mostly the ones that come in the mail with BILLS) and added those. Since I'm new to the whole bind-it-all thing (and I was trying to be cheap) I only punched 6 holes. Totally regret that now because it will only stand like this. Note to self (or anyone else who just got the bia) make more holes! Hey everyone! It's Ruthie from SeptemberNinth, I have a fun shaped card to share with you today! 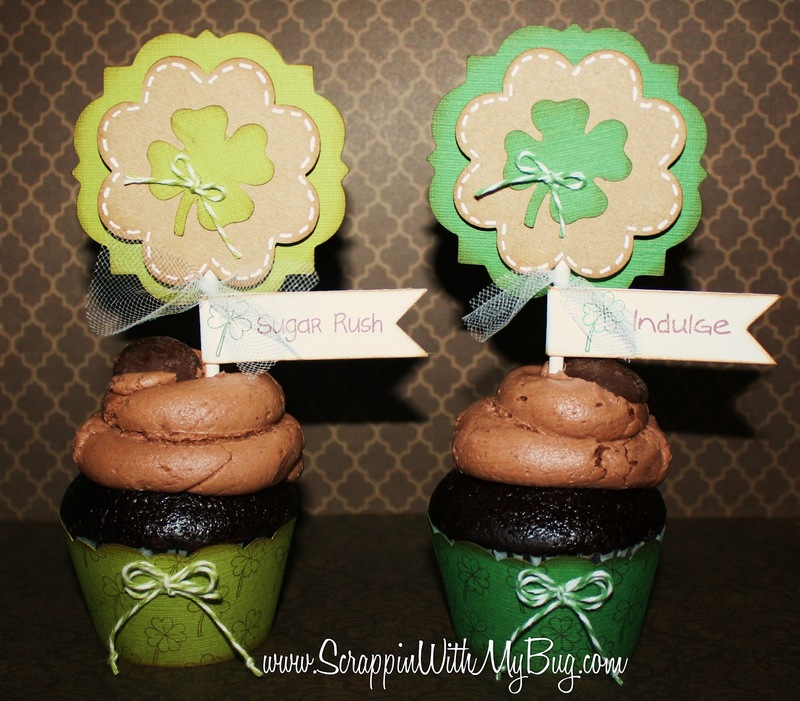 I used Jaded Blossom's small flag die, the Miscellaneous Fun, and the Food and Drink stamp sets. For more photos and info about today's project, click here! Hello everyone! I am so excited to be guest designing for Jaded Blossom! I love them because first of all they are awesome ladies! And second because their ideas are always so fun and exciting! 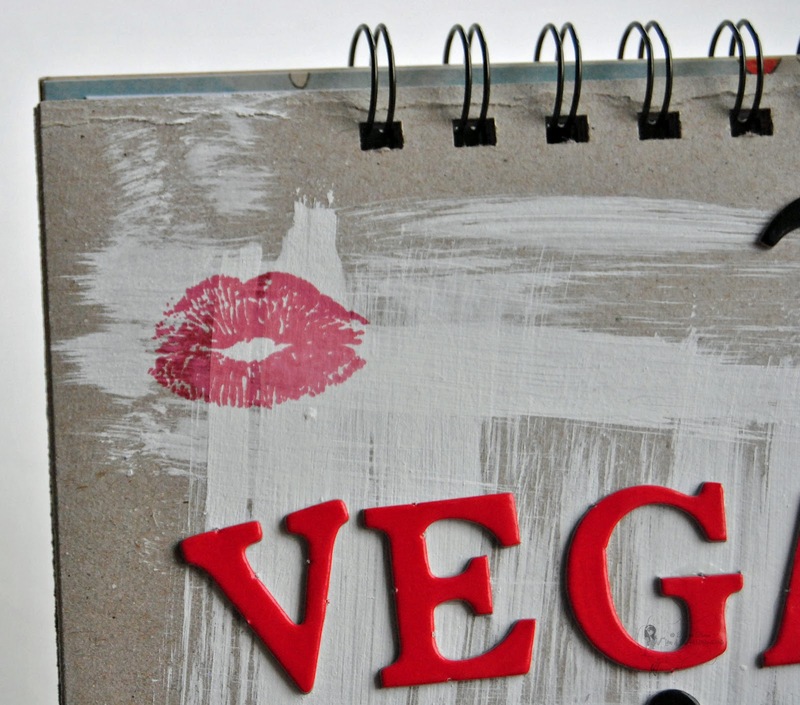 Their products are different and super adorable! I created this card using two of their products. This Flag Die is super useful! I love the length of it and that I can cut it and use what I need. The other product I am using is their super cute and adorable stamp set Cheesy Pick Ups! I LOVE LOVE these stamps!! Thank You so much for visiting! 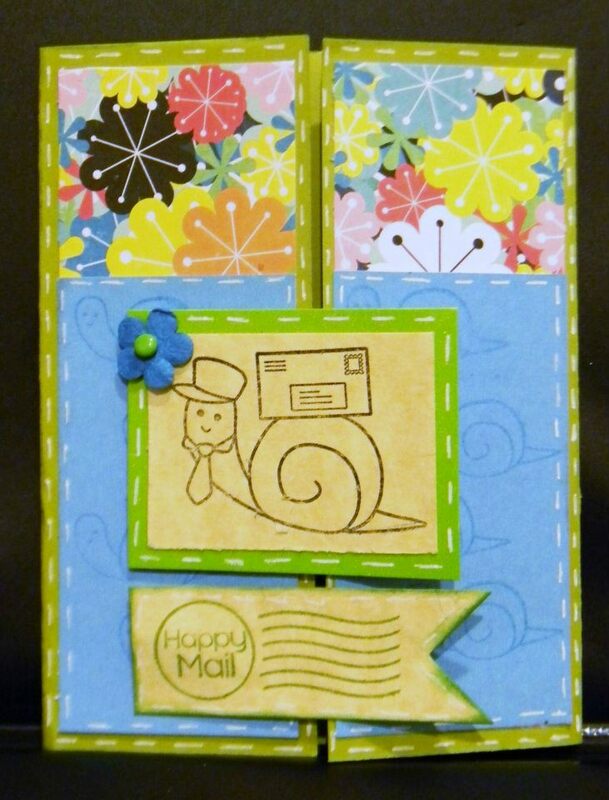 I hope you enjoyed my post and my card! 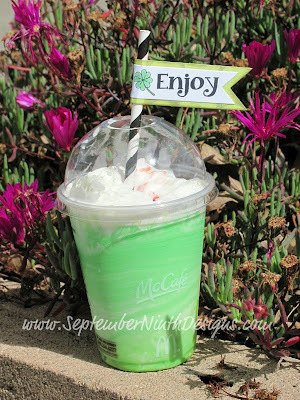 ohhhh and I have a winner on my blog!!! Make you sure you visit! I used the Jaded Blossom Flag Die for the pink flags and the Baby flag. 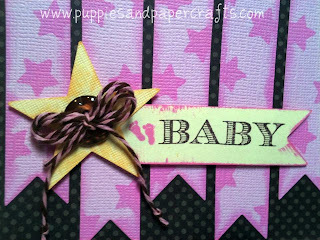 I stamped the star on each pink flag from the Jaded Blossom Miscellaneous Fun set! It's Jamie here to share a cheesy card with you! I used the Cheesy Pick Ups set and the new Flag Dies for my card. 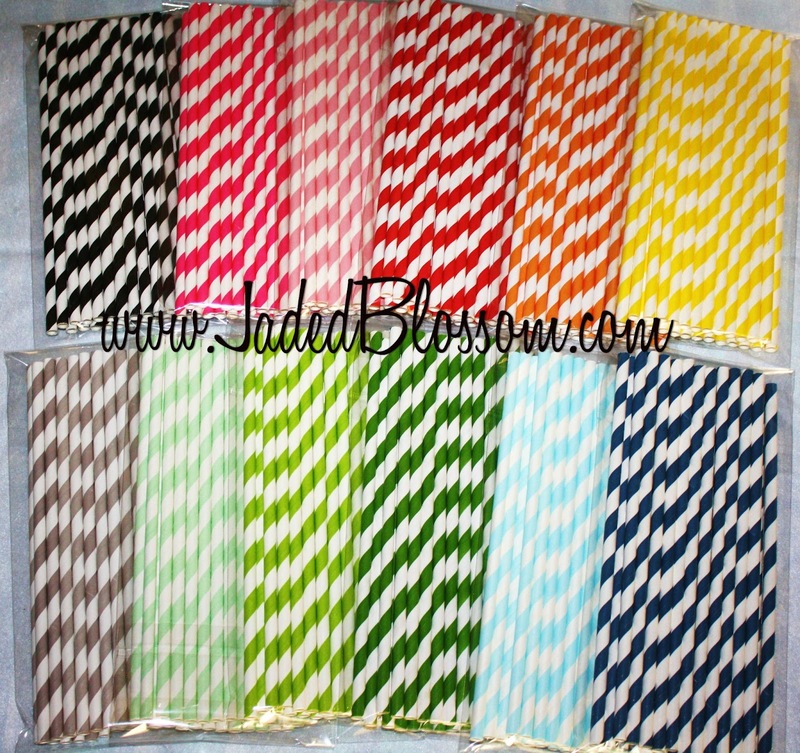 I am in love with these flags! There are just sooooo many different things you can do with them. Please visit me here for complete details on my project. 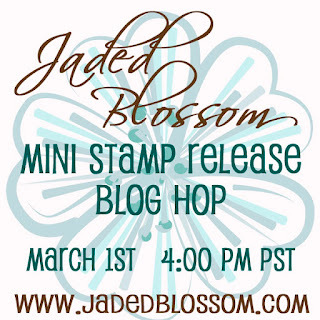 Thank you to everyone who participated in our Stamp Release blog hop! We hope you enjoyed looking at all the wonderful projects the Design Team created. 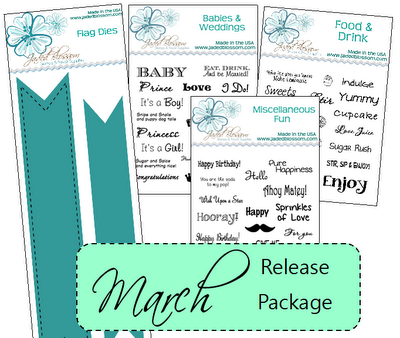 We had two prizes we were giving away this month.. first was a Princess Party cricut cartridge. Second was an Echo Park 6x6 Paper stack.. Are you ready to see who the winners were? 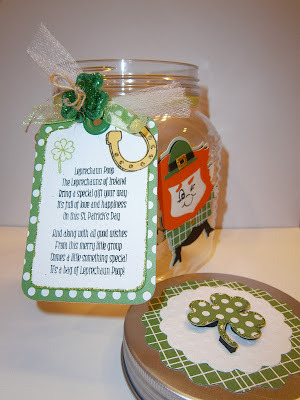 Jessica from The Creative Stamper's Spot! 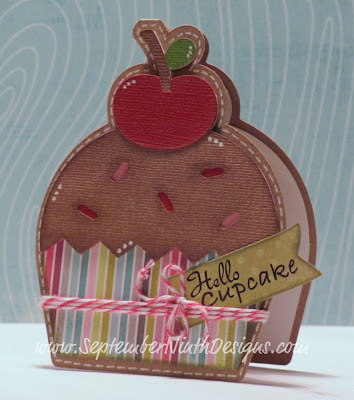 Jessica from Craftin' and Stampin'! It's a lucky day for Jessica's! 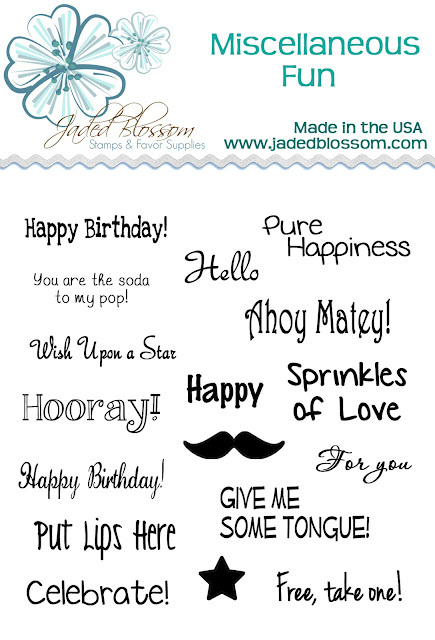 :) Please email us your mailing address at admin@jadedblossom.com.